RDs interviewed by Today’s Dietitian say healthful snacking boosts metabolism, reduces hunger, and provides vital nutrients between meals. Whether it’s a bag of chips, a sleeve of cookies, or nothing at all, most male clients can use some education on the topic of smarter snacking. And the reasoning goes something like this: With work demands and family obligations, many men feel lucky if they can fit in a quick lunch, let alone a midmorning or afternoon snack during the work week. According to Tara Gidus, MS, RD, CSSD, LD/N, a nutritionist for the Orlando Magic NBA team, snacking can help solve what can happen when someone goes too long without food: overeating. “Men tend to eat large portions at meals and forget to eat between meals,” she says. “They get ravenously hungry, which leads to making poor choices, eating too quickly, and then overeating. 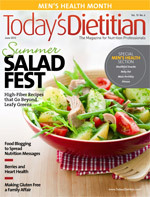 Today’s Dietitian spoke with RDs about the importance of healthful snacking for the average male client and collegiate athlete as well as the most important nutrients they should contain, and they provide creative snack ideas these men can make at home or purchase at their neighborhood supermarket. Step one in overcoming men’s most common obstacles to healthful snacking is defining what to eat vs. what not to eat. Twombley says the clientele she works with most, young college athletes, often struggle with the same constraints as older working professionals: time. The answer for both is preparation. Whether your client is a professional ball player, a corporate executive, or a stay-at-home dad, smart snacking has benefits for him. There’s no snack that will be equally sufficient for every person, but they should contain 300 kcal, 1 g of fat, 1 to 2 g of saturated fat, 15 to 20 g of protein, and 30 g of carbohydrate, explains Leslie Bonci, MPH, RD, CSSD, LDN, director of sports nutrition at the University of Pittsburgh Medical Center and the Pittsburgh Steelers’ team dietitian for nearly two decades. Lydon also likes protein for its muscle-building abilities, noting that for one 6-oz serving of Chobani Greek yogurt, men get 13 to 18 g of protein. Add some granola such as a single serving of Bear Naked Peak Protein Granola, and it adds an additional 6 g of protein. Burda prefers to indulge his sweet tooth when tension hits and suggests clients do the same. “Chocolate-covered almonds or peanuts or yogurt-covered peanuts or raisins is something that I turn to,” he says. White likes the crunch of pretzels or nuts in times of high stress. If none are available, he turns to instant oatmeal with dried fruit. Gidus recommends snacking outside the box, especially for men who are particular about what they eat. She suggests men find a sandwich they like and serve it in smaller portions. “Snack doesn’t always mean traditional snack food,” she says. One-half of a sandwich makes a suitable midafternoon snack. Bonci likes recommending a healthful serving of nachos to her players, consisting of baked tortilla chips, black beans, salsa, and shredded light cheese. Hot summer days call for lighter snacking options. When trying to beat the heat, White chooses a 1/2 cup of low-fat cottage cheese sprinkled with 1 T of ground flaxseed, or 3 cups of popcorn. Bonci recommends premade smoothies by Odwalla and Naked. She also likes frozen fruit bars, Laughing Cow spicy cheese wedges with celery, and spicy black bean dip such as Desert Pepper with Special K chips for summer snacks. If your male athlete clients know their way around the kitchen, suggest they try a high-calorie smoothie recipe from Chef Tory McPhail that Twombley often uses: 1/4 avocado, 1 oz pistachios, 8 oz skim milk, 6 oz Greek yogurt, one banana, and ice for texture. “This smoothie also is great for posttraining recovery to build mass,” she says. For men who prefer to buy smoothies, Jamba Juice offers a new Fruit & Vegetable smoothie that provides two full servings of fruit and one full serving of vegetables. “Smoothies are an excellent way to get fruits and veggies, which provide fiber, vitamins and minerals, and antioxidants,” says Gidus, who also is a Jamba Juice Healthy Living Council member. Roof says homemade jerky is as simple as marinating thin slices of meat for several hours, then spreading them on a wire rack to dry in the oven at 175˚ to 200˚F. Clients can use a food dehydrator instead if they’re interested. Guys who’d rather buy than make their own meaty snacks can try various types of seasoned turkey, beef, and venison jerky by Premium Buffalo Bills. White’s favorite preworkout snacks include bananas, veggies with hummus, and whole grain crackers with deli meat. One healthier meat line is Farm to Fork Naturals, made from pork or turkey raised with no antibiotics and 100% vegetarian feed. Is hummus too “girly” for some guys you know? Maybe they’ll like Kashi’s new Hummus Crisps, made from chickpeas and the company’s signature whole grain blend—but with a guy-friendly look. Before an intense cardio workout, Bonci, who’s also a spokesperson for the California Dried Plum Board, recommends that players eat an apple with peanut butter. Her best posttraining snack suggestions include a serving of California dried plums and almonds or “nature’s muscle milk,” a 16-oz bottle of low-fat chocolate milk, such as TruMoo, which boasts twice the carb and protein count compared with many juices and sports drinks. Twombley offers a word of caution, however, to men who may rely too much on their daily shake or supplement: “Many men get sucked in to ‘supplement’-style snacking. They somehow become convinced that they require protein shakes, preworkout supplements, or additional protein, forgetting that foods also can offer the nutrients required for building muscle and recovery. Teaching athletes when to fuel with protein and carbohydrates is a crucial step in teaching them how to recover. By translating the nutrients into foods, the athletes have an easier time understanding how to implement their plan. “For instance, [they can] add lean protein to foods high in antioxidants for afternoon snacks, such as fruit and Greek yogurt, tuna and carrots, or pistachios and dried cranberries,” she adds. “I try to remind athletes that all supplements are found in foods.” For extra omega-3s, clients may enjoy Bumble Bee’s new Prime Fillet Omega-3 Albacore; each serving contains a combined 200 mg of EPA and DHA. For guys with a sweet tooth, White recommends a sampling of fruit such as a small box of raisins, apple slices sprinkled with cinnamon, or 1/2 cup of strawberries with 1 1/2 T of nonfat yogurt. Instead of yogurt, guys can top the season’s best fruit with nut butter, Hammond suggests. “Nuts or nut spreads are a fantastic and satisfying snack choice,” he says. If there’s one cooking apparatus that’s got male written all over it, it’s the grill—and summer is the grill’s best friend. Instead of the typical burger and hot dog fare, suggest male clients grill some healthful snack options for the Fourth of July parties they may be hosting this year. Know some clients who are particularly adept at grilling and may be up for a challenge? Bryan Roof, RD, LDN, a chef and senior editor at America’s Test Kitchen, suggests guys try their hand at grilled jalapeño poppers or bruschetta with grilled bread and a variety of fresh veggie toppings. He also prefers grilled veggie crudités with a cool yogurt dip or grilled prosciutto-wrapped fresh mozzarella or melon. 2. Peel and core pineapple and cut into 1-inch rings. Brush each ring lightly with olive oil using a pastry brush. 3. Heat the jelly on the stove or in a microwave to liquefy and brush on the pineapple with a pastry brush. Grill 2 to 3 minutes per side, until lightly browned and you see grill marks.